Discussion in 'The Bar' started by dawg, Nov 5, 2010. 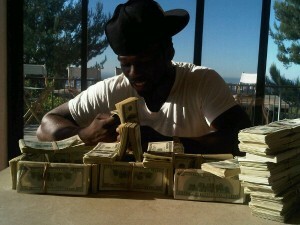 London, Nov 05 : Rapper 50 Cent is swimming in money and to prove it he has tweeted pictures of himself playing with stacks of money said to be in the amount of half a million dollars. 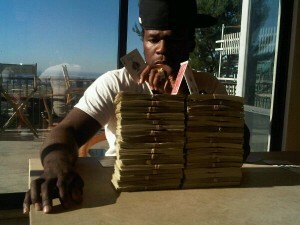 The singer, 35, real name Curtis James Jackson, is seen in one picture stacking some playing cards on top of a huge pile of used notes. Added to it was the caption: Ã¢â‚¬Å“This is the life baby IÃ¢â‚¬â„¢m going to Vegas with Floyd IÃ¢â‚¬â„¢ll double this quick,Ã¢â‚¬Â the ********** reported. 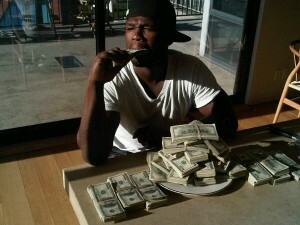 In another photo he is shown flicking through huge wads of cash, he Tweeted: Ã¢â‚¬Å“Holy s**t bat man I think IÃ¢â‚¬â„¢m rich. LOLÃ¢â‚¬Â. One showed him pretending to tuck into the pile of cash with a knife and fork, Tweeting: Ã¢â‚¬Å“IÃ¢â‚¬â„¢m eating good baby and IÃ¢â‚¬â„¢m still hungry. LolÃ¢â‚¬Â. 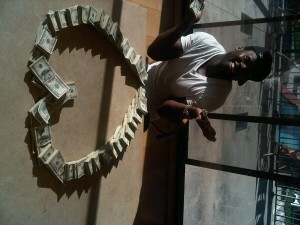 And another showed him posing with a stack of bills between his lips as he gazes pensively off into the horizon. He should see what things I do with my money before the cashier takes it. Are rich black people scared of poor whites? 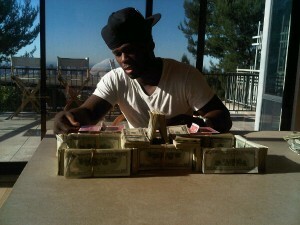 Added to it was the caption: “This is the life baby I’m going to Vegas with Floyd I’ll double this quick,” the ********** reported. 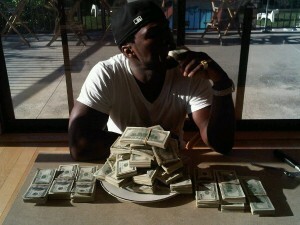 In another photo he is shown flicking through huge wads of cash, he Tweeted: “Holy s**t bat man I think I’m rich. LOL”. 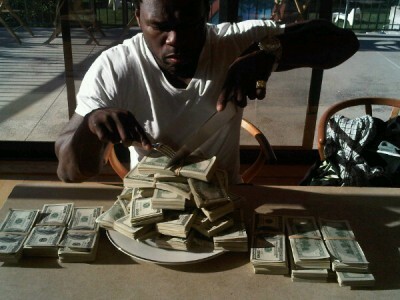 One showed him pretending to tuck into the pile of cash with a knife and fork, Tweeting: “I’m eating good baby and I’m still hungry. Lol”. That's just daring somebody to rob him.